Fry the diced onion and crushed garlic until the onion has softened. Add 250g of spinach to the pan and cook until it has wilted, then squeeze to drain it. Mix in a pot of ricotta (about 250g or the same weight as the spinach). Add a teaspoon of nutmeg, a pinch of salt and a very generous grating of black pepper. At this point you can add you special added ingredient. I chose half a pack feta but hard-boiled eggs or a smaller amount of blue cheese would also work. Mix it well. Next, spray oil on both sides of each sheet of filo (I used four), gently line the cake tin with them at a variety of angles, leaving the excess to hang over the sides. 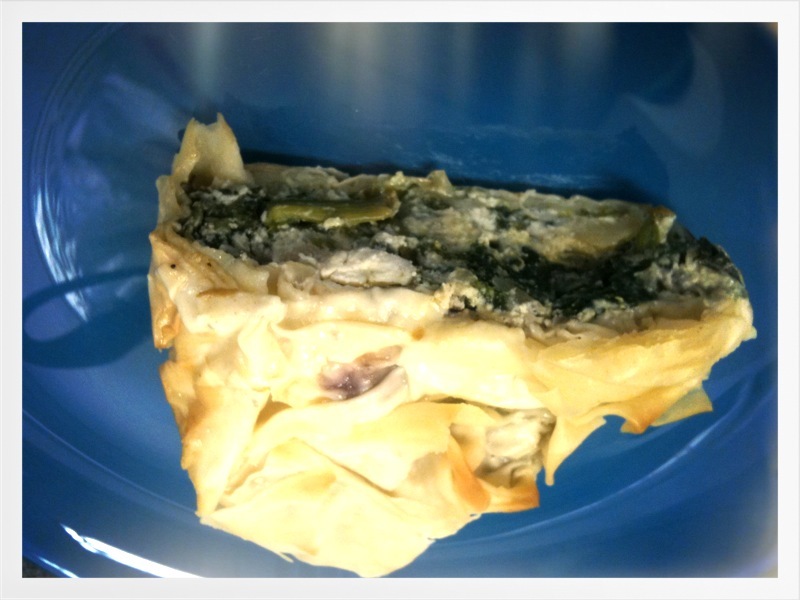 Whack your mix in and pile the excess filo on top allowing it to create peaks and folds that will crisp. Cook for about 30 minutes at 180 degrees. Can anyone get enough of cupcakes at the moment? It seems not. Good old Mary Berry and her Great British Bake Off has set us all squealing at the sight of a piping bag and running to the shops to stock up on flour and eggs. It seems dear Mary hit our TVs with perfect timing – just as the nation started to fall back in love with ‘Britishness’ and the warmth that comes with home baking. Suddenly baking became retro, add a kitsch kitchen appliance, a hint of the 1940’s housewife and it became a craze. Now you’d be hard pressed to find a wedding or birthday that doesn’t involve homemade cake, even the office colleagues are falling over themselves at the charity cake bake sale. Not one to do things by halves I wanted to try the giant cupcake mold and thought I’d try silicone baking equipment for the first time. I had worried that a poor quality mold would make the cake taste funny or at worst be toxic, but after some reading up I discovered that a pure silicone mold is absolutely safe. The best way to tell, I was told on the blogosphere, is to bend the mold. If it appears white or the colour fades at the fold it may be a mix of silicone and plastic – i.e. a cheap knock-off not to be used. At a meager £5.95, the one I opted for seemed too good to be true but four cakes on and I’m still a fan. One thing I will say though is that the instructions were paltrier than the price and the advice on line was confusing and contradictory. So, I’ve given you some of my own instructions below. Heat the oven to 160 degrees – don’t be tempted to go higher as the molds are large and will need to be baked at a low heat for a long time. Remember to fully grease and flour both molds (you can pop them inside out to get better coverage). Next, fill it with your mix. If you’re using a packet mix I suggest using two packs. If making your own, a recipe of 8oz of flour, 8oz of sugar, 80z butter and four eggs should do the trick. I added cocoa to this one. You want about two-thirds of the mix in the bottom mold and one-third in the top. Bake for one hour but on the first bake I advise checking after 45 mins, then again regularly until it is springy and coming away at the sides. The top mold may bake quicker than the bottom mold as you have less mix in it. A good way to test is to plunge a knife in; if it comes out clean it’s done. Leave to cool and turn out. You can fill and top the cake with frosting, cream, ice cream or fruit and decorate with sweets. I used a butter icing made with margarine, icing sugar and cocoa. The mold is dishwasher friendly though remember to give it a good clean as the mix likes to stick to the creases. I would recommend silicone bakeware to anyone who is intrigued to try it or is on the look out for a cheaper alternative to traditional tins. In terms of the bake, I found it just as good a normal method. 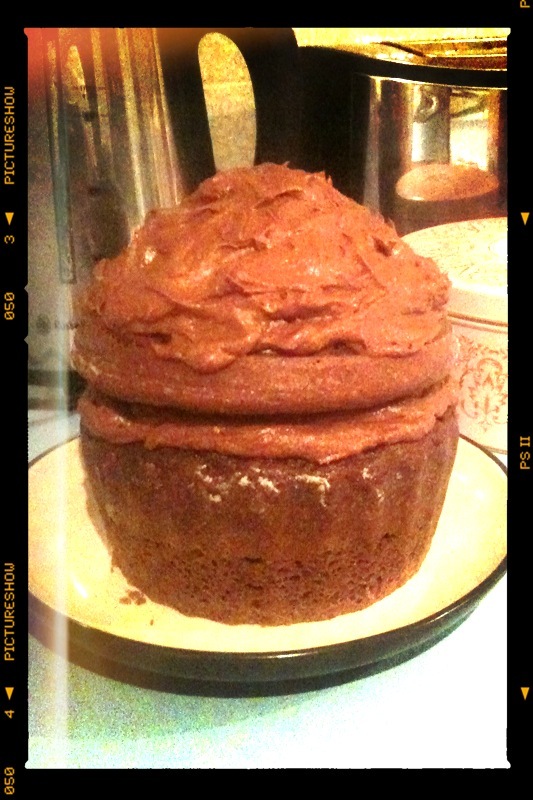 In terms of the cake, well, a giant chocolate cake? What’s not to like!